Democrats spent the night talking on the Senate floor Monday in a final attempt to derail the nomination of Betsy DeVos, President Trump's choice to become the nation's education secretary. The rare all-night talkathon was a response to a flurry of opposition to DeVos' nomination being generated by their constituents back home and a last-ditch effort to find one more vote for what is shaping up to be a razor-thin confirmation for the Michigan billionaire. 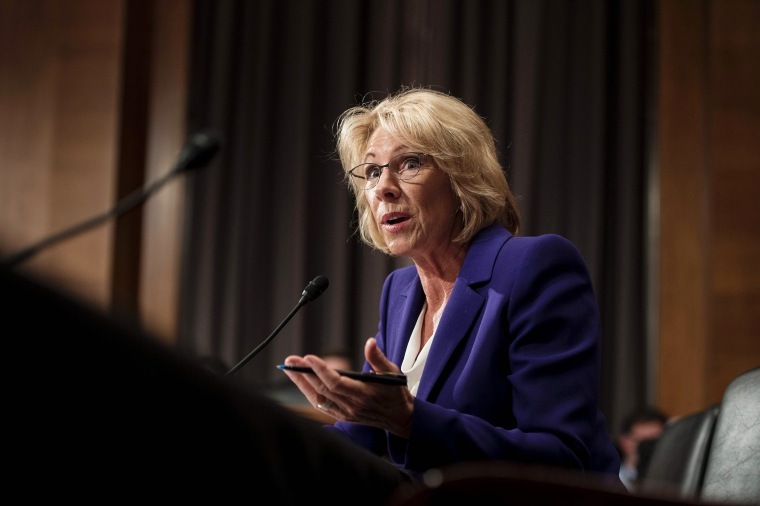 Concerns over DeVos, who is a sharp critic of public schools and has personally invested in private and charter schools, have straddled political party lines. Two Republicans – Sens. Susan Collins of Maine and Lisa Murkowski of Alaska – are rare defections from their party on a cabinet nomination. They announced last week that they would oppose DeVos’ nomination, throwing her confirmation dangerously close to failing. Those two defections, combined with the opposition of every Democrat, leaves just 50 GOP senators supporting her, a margin which would force Vice President Mike Pence to cast the tie-breaking vote on her final confirmation, scheduled for mid-day Tuesday. Democrats need the help of Republicans to block a nomination because a simple majority is required for cabinet positions. If one more Republican breaks ranks, DeVos’ nomination is defeated. It doesn't appear likely that another Republican will break ranks, however. And Sen. John Cornyn, R-Texas, called the Democratics' tactics "juvenile." He said Democrats can vote against a nominee but they shouldn't "slow walk" the confirmation process. Cornyn added that Democrats are giving in to the "irrational rage being depicted in some quarters." Democrats have three major qualms with DeVos. They say she has little understanding of education, is philosophically opposed to public schools, and her business ties poses questions about conflicts of interest. “She doesn’t approach this the way most of us do. She doesn’t cherish public education. She doesn’t value it,” Murray said Monday, opening up the 24-hour defense. DeVos struggled through her confirmation hearing two weeks ago. Democrats criticized her for being unable to answer basic questions about education philosophy and expressed concern over her business ties, some of which are in education. “Devos has no experience in public schools as a student, teacher, administrator or even a parent,” said Massachusetts Sen. Elizabeth Warren. Public concern over DeVos has also reached unprecedented levels. The high number of calls to the capitol switchboard “are contributing to delays” in reaching a senators office. One Nevada resident, Mickey Hollingshead, called the office of Sen. Dean Heller, R-Nevada, last week multiple times and could not get through. He was able to leave a message on the sixth try. Heller said he would support DeVos, but he is in a precarious political place. He is the only Republican running for re-election in 2018 from a state that Trump lost. He must weigh the needs of his party and president with his re-election efforts. “We’ve received a high volume of phone calls over the couple of weeks but that’s to be expected with all of these high-profile nominations,” Smith said.